Like a bolt out of the blue! A WIP Gaming Aid that will aloow your players to keep track of other, non-combat, conditions that they may suffer. 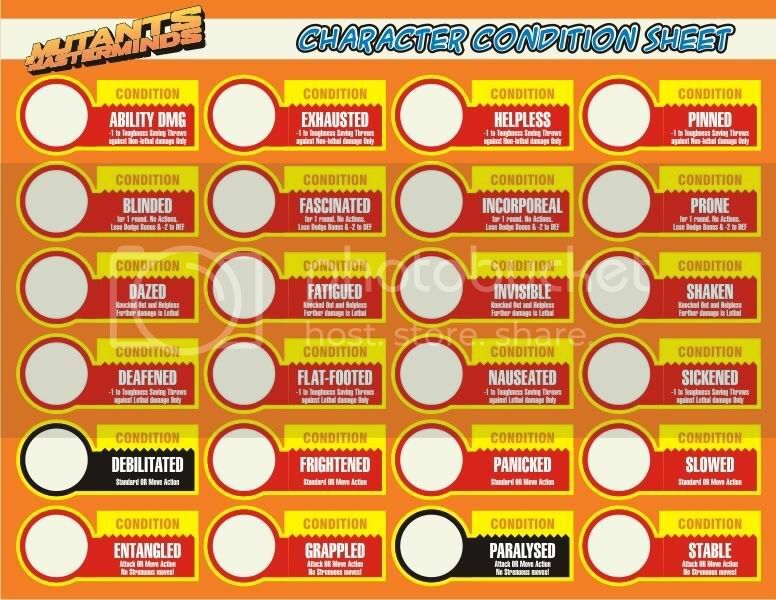 Either laminate the sheet and use wipe-off markers or use those 'gems' or 'tokens' that may be bought for gaming use. Silverback wrote: Like a bolt out of the blue! This is neat too SB. Not sure how it'd work since I'm already using the Condition Chips well. It has alot of the other conditions though, I'll try printing it and testing it Friday. Again - the only suggestions is the reference page numbers to look up for the players with that Condition. As a side note. I make up a character binder for each player. This will be a good sheet to put in the "clear cover" back of the binder cover, then use the binder cover itself as the "laminate" to mark with markers. I need to get a good camera to take a picture of all these various game props that I've made - mine and the stuff I've made from your work SB. They really really look professional as heck. Demongg wrote: . . . It has alot of the other conditions though, I'll try printing it and testing it Friday. . .
Not a good idea! It doesn't have the correct condition penalties listed at the moment. Just try one new thing on your players at a time! This is neat. I look forward to the finished version. I have to ask, though. Where do you find the time to make all of these nice looking gaming aids? Robrich8705 wrote: This is neat. I look forward to the finished version. These may be better as chits that are handed out rather than a sheet that sits in front of each player. Robrich8705 wrote: I have to ask, though. Where do you find the time to make all of these nice looking gaming aids? Page 106 of the core rulebook, first column about two-thirds of the way down the page.